The field of robotic exoskeletons is growing quickly. If you are interested in the field, these articles will help get you started. 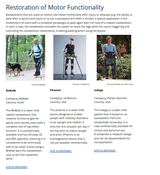 You will find a selection of articles covering different aspects of exoskeleton technology. These are not scientific articles, but rather meant as an accessible introduction of exoskeleton technology. Because we have been asked whether guest contributions are possible, the answer is clearly yes. If you are interested, please contact us with your suggestion. We will expand this knowledge base in the future to cover more aspects of exoskeleton technology. Join us and discover the different exoskeleton companies and research projects in Switzerland. An overview of the history of robotic exoskeleton development. From the very early devices to today's state-of-the art exoskeletons. To give you an overview of today's robotic exoskeletons, we compiled a catalogue with a selection of state-of-the-art systems sorted by their main purpose and application. A very short introduction into the basics of robotic exoskeletons. What are they used for today? How do they work? An article for anyone who just started to discover the field.